These large evergreens are best fertilized using preformed stakes. Pound into the ground in the drip line as directed after a soaking rain in very early spring. Fertilizer stakes for evergreen trees will slowly release into the soil after each rain. Apply only once each year. Growth Rate: 2-3 feet per year the first 25 years. In heavy soil 1 foot per year. Water Requirements: Average, very drought tolerant once established. Does not like wet soil. Growth Form: Branches arch upward (pendulous) with branchlets drooping down from the branches in the upper canopy (evident skirts). Norway Spruce should be planted on a large property, it is an immense tree. It grows rapidly with strong graceful branches in a symmetrical form with a strong central leader. With a deep spreading root system, it will provide an excellent windbreak or snowbreak, withstanding speeds up to 100 mph. The foliage is dense in full sun, less dense in part shade. Norway Spruce prefers moist cool climates. It is quite tolerant of urban conditions. Growth Form: Broad and spreading, wide conical upright. Branches are long and pendulous (arching upward). Cone or Berry: Bright red in spring, maturing to light brown by summer. Bears abundantly. Cones are retained for about a year. Pest Resistance: Deer and rabbits only eat when desperate. Spacing: 20 feet apart or more to allow for spreading. The ‘Acrocona’ cultivar or Norway Spruce has all the advantages of the full size Norway but in a substantially smaller size appropriate for nearly any landscape. And the spring cones produced abundantly on the branch tips are bright scarlet, definitely a striking point of interest. As the cones mature they turn tan and droop downward. This is a very elegant evergreen that should be palnted where it can be appreciated. ‘Acrocona’ also likes the cool climates, well suited to the upper Midwest. This cultivar is rare and will not be found easily. Your best bet is high end nurseries or mail order. You may find it grown from seed, which grows very slowly. If grafted, it grows quickly initially then will slow down, and may have smaller cones. Water Requirements: Average, tolerates drought and does not like wet soil. Growth Form: Pyramidal with a dense crown that develops a flattened top and spreading upswept branches at maturity. Occasionally a tree will retain a pyramid form with downswept branches. 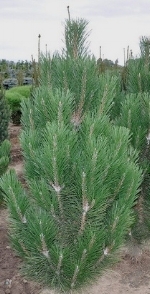 Foliage: Long flexible needles are 4-6 inches, borne in pairs, sharp tips, dark green. Needles are retained up to 4 years. Cone or Berry: Ovoid cones are 2-3 inches, light brown. They remain on the tree for several years. Disease and Insects: Very resistant to most problems, but susceptible to Diplodia tip blight and pine tip moth, damage appearing similar. Pest Resistance: Deer may feed on young trees when food is scarce. Austrian Pine is a very hardy evergreen tree perfect for landscapes with ample space. It is very adaptable, withstands heat and drought, road salt, as well as windy conditions. Excellent for a windbreak because of its’ tolerance, but as the trees mature the form becomes more open, somewhat reducing screening. Branching in the lower half of the trunk may become more sparse, exposing and interesting bark of chalky gray ridges and dark furrows. Also does well in urban environments or seaside regions. In urban environments mature size is generally about 40 feet tall and 20 feet wide. It likes the cooler regions of zones 4-6, but temperatures below -25F may cause winter injury. Austrian Pine naturally produces variations, some of which have become named cultivars. ‘Jeddoloh’, ‘Arnold Sentinal’ and ‘Pyramidalis’ are 25’ slightly more columnar forms with upright branching and blue green needles. ‘Hornibrookiana’ is a dwarf mutation that is only 2 feet tall and 2-3 feet wide. Stiff needles are deep green. Water Requirements: Prefers consistent water, keeping soil moist. Soil Preference: Prefers moist acid soil. Tolerant of heavy clay to rocky and a wide range of pH. Growth Form: Narrow pyramid with a dense crown and slender spire. Foliage: Short resinous needles are 1/2-1 1/4” long and flat with blunt or notched ends. Needles are shiny dark green with a silver blue underside. Cone or Berry: Year old branches at the crown bear upright, 2-3”, cylindrical, purple green cones, beginning at 20 or 30 years. Disease and Insects: In cool summer climates, rarely affected by disease or insects. Somewhat susceptible to trunk canker, woolly adelgid and spruce budworm. Spacing: 25-30 feet apart. When crowded, lower branches may die off. Balsam Fir may also be commonly named Canadian Balsam, Easter Fir or Blister Fir. Whatever the name, they are of the Abies Genus of true firs, and closely related to the Frasier Fir. The root system is shallow, rarely more than 30” deep. Especially when the soil is wet, Balsam Fir may be blown over in high winds. A planting site protected from storm winds would be helpful. Does not toerate drought, heat or pollution. Balsam Fir is rarely used as a landscape plant, but is very popular for a Christmas tree. Water Requirements: Average requirement. Somewhat drought resistant but will need supplemental moisture during periods of drought. Soil Preference: Prefers moist loam, well drained, acidic pH 4.0 to 7.5. Does not do well in clay and wet soils. Growth Form: Very dense pyramid with long lateral branches. Foliage: Half inch stiff needles attached individually on peglike sterigmata. Variably green, from bright green to blue green. Needles persist for 3 or 4 years. Cone or Berry: 2-3” brown cones borne toward the ends of branches. Disease and Insects: Somewhat susceptible to needle blight and spruce beetle. Pest Resistance: May be browsed by deer only if food is scarce. Spacing: 25 feet or more apart, 14-20 feet apart for windbreak. Black Hills Spruce is a naturally occurring variety of white spruce, but is better adapted to Midwest regions than white spruce. Growth rate can be over 12 inches per year in ideal conditions, but generally grows slower, reaching about 12 feet in 20 years. Although it is sometime difficult to tell the difference between a Black Hills Spruce and a Colorado Spruce, the Black Hills is not as drought tolerant as the Colorado. The root system is shallow and wide spreading but very wind firm. Black Hills spruce is a medium to tall evergreen tree excellent for home landscapes, and will provide a good windbreak. In excessively wet periods, fungal disease can adversely affect Black Hills Spruce, so it should not be planted in the middle of a densely planted windbreak. Somewhat salt tolerant. Water Requirements: Average requirements, very drought tolerant. Soil Preference: Prefers moist, well drained loam with acidic pH 6.0 - 7.5. Fairly adaptable. Growth Form: Broadly dense pyramid. Long lateral branches. Foliage: One inch stiff pointed needles attached individually on peglike sterigmata. Variably green, from dull green to bright blue green to silvery blue. Needles persist for 3 or 4 years. Cone or Berry: 3-4” dark brown pointed cones borne in the upper branches and hang downward. Cones form in autumn and drop the following autumn. Disease and Insects: Somewhat susceptible to spider mites and spruce gall aphids. This is one of the most popular landscape evergreen trees because of the blue foliage and dense symmetrical growth. Glauca is the naturally occurring variant grown from seed, however the bluest colored plants are often asexually propagated. Acidic soil below 6.0 may help to maintain the blue coloring, but will not change a more green foliage to blue. Colorado Blue Spruce will not tolerate shade well, is very drought tolerant, and will not tolerate standing water or persistently wet soil. The shallow root system is wide spreading but windfirm. Planted about 16 feet apart, they form an excellent wind and snow screen. There are many cultivars of Colorado Blue Spruce that display a variety of growth forms from dwarf, to globe form to weeping. Colorado Blue is sometimes called Silver Spruce. Mature Height: 40-60 feet up to 100 feet. Life span: As much as 500 years. Water Requirements: Requires consistent moisture and good drainage. Does not tolerate drought. Soil Preference: Prefers rich, moist, well drained soil, slightly acidic. Foliage: 3/4” needles, shiny green to yellow green. Cone or Berry: 1/2-1” ovoid cones. Cones are green initially, then mature brown their second year. Disease and Insects: Susceptible to hemlock wooly adelgid. Fertilize: Apply fertilizer stakes as directed in early spring. Do NOT over-fertilize, especially when young. Canadian Hemlock grows best in part shade and tolerates part shade, and prefers a cool humid climate with consistent rainfall or heavy snowfall. Its’ preference for shade is unusual for conifers, allowing it to be planted where others don’t grow well. Branches are wispy and horizontal with tips slightly downturned resulting in a fine textured and graceful appearance. Branching is open unless it has been sheared periodically in the nursery. Root zone should be mulched to keep moist and cool. Select a protected site for Canadian Hemlock, it will not tolerate winter wind. Urban conditions and road salt are also not tolerated. A good selection for rural or suburban landscapes. Plant in spring, not in autumn, and stake until the roots establish. Also known as Eastern Hemlock. Water Requirements: Average, tolerant of dry periods once established. Soil Preference: Average to rich well drained soil. Will not tolerate standing water. Not fussy about pH. Growth Form: Narrow upright conical with short compact branches that fork upward sharply. Foliage: Sharp blue gray needles. New growth is most intensely blue but remains quite strongly blue. Cone or Berry: 2-4” cones are formed at the branch tips. Disease and Insects: Susceptible to spruce gall aphid and spider mites. Spacing: 10 feet or more apart, 7-9 feet apart for screen or windbreak. ‘Fastigata’ is a very narrow columnar Colorado Blue Spruce excellent for small spaces where height is desired. It may spread some with maturity but can be kept compact by shearing or pinching the branch tips. Grafted varieties may mature at much smaller heights. Some will grow to about 6 feet tall and 2 feet wide in 10 years but may mature at around 25 feet. ‘Fastigata’ is quite tolerant of urban conditions and somewhat tolerant of road salt. It is best to plant where it has some protection from winter winds to prevent winter burn. Life span: 200-250 years, as many as 400 or more years. Soil Preference: Prefers well drained sandy soil. Does not like clay soil, but will adapt to poor soil and dry conditions. Growth Form: Straight trunk with a conical crown when young, maturing with long horizontal branches that turn upward. Foliage: Flexible bluish green needles are 2-5” long in bundles of 5. Needles persist for about 18 months. Cone or Berry: 3-6 inch slender, light brown cones, production peaking every 3 to 5 years. The cones cluster in the upper third of the tree. Disease and Insects: Susceptible to white pine weevil and white pine blister rust. Pest Resistance: Sometimes browsed by deer and rabbits. Fertilize: Apply fertilizer stakes as directed in early spring. Spacing: 35 or more feet apart, 15-30 feet apart for screening. Eastern White Pine may also be referred to as Northern White Pine or Soft Pine. When “Glauca’ is used in the cultivar name, it simply means that the needles tend to be more blue than green. This evergreen prefers cool humid regions but are not particularly fussy. The mature form is somewhat asymmetrical, and can be pruned in spring to increase density by pinching off half from the new growth tips.. The tree firmly anchors with a taproot and few large roots spreading out and downward. However the wood is not strong, and may crack or snap in strong winds, especially if laden with snow or ice. Where space allows, Eastern White Pine tolerates urban conditions, growing more slowly than in rural conditions. In urban settings it is more susceptible to chlorosis in alkaline soil. It is not tolerant of road salt spray. Several cultivars are available including a narrow upright Fastigiata, a wide weeping form Pendula, a dwarf globe Nana and a dwarf upright Compacta. Mature Height: 30-50 feet, up to 80 feet. Water Requirements: Requires moist climate with 75-100” precipitation per year, but does not tolerate drought periods. Soil Preference: Well drained, acid pH. Does not tolerate heavy wet soils. Foliage: 1/2” - 1” needles are flat with a rounded or slightly notched tip. The shiny dark green needles have two silvery bands on the lower surface. Cone or Berry: 1 1/2” - 2 1/2” erect cones are green to dark purple, maturing to light brown. Pest Resistance: Balsam wooly adelgid can severely damage the evergreen, and is currently devastating the wild population. Closely related to the ‘Balsam Fir’, some consider it a subspecies. ‘Fraser Fir’ is a small evergreen, by standards of the large evergreen tree, reaching generally 30-50 feet tall. Straight branches are horizontal at the base, angling upward progressing up the trunk, to form a strong conical crown. A young ‘Fraser Fir’ is quite dense. The form opens up as the tree matures. Limbs are strong. ‘Fraser Fir’ is a Christmas tree favorite, but is quite difficult to grow. I requires a cool moist climate and well drained acid soil. It does not tolerate drought, pollution, moist soil and many insects. “Fraser Fir’ is very difficult to find other than from commercial Christmas Tree growers. Soil Preference: Average to slightly sandy soil, well drained, slightly acidic. Very adaptable, tolerating heavy clay. Foliage: Dark green fanlike foliage, maintaining a good green through winter. Disease and Insects: Generally resistant to most problems, occasional spider mites or bagworms. Fertilize: Apply fertilizer stakes as directed in early spring. Additional 6-12-12 or 10-10-10 granular or water soluble fertilizer in early fall. ‘Green Giant’ Arborvitae is a nice alternative to the large species evergreens of course texture. This giant arborvitae reaches 60 feet tall and displays the lovely fernlike texture that arborvitae are known for. It grows very quickly, maintaining a dense pyramid form. ‘Green Giant’ will generally reach 25-35 feet tall and 5-6 feet wide in 10 years. Claims of 5 feet growth in a year are unsubstantiated. In the southeast warm zones, ‘Green Giant’ will often brown somewhat in winter. Excellent as a screen or windbreak, or just a large specimen tree where vertical accent is desired but space for a 30-40 foot wide tree may not be available. Can be expected to live for 50 years.